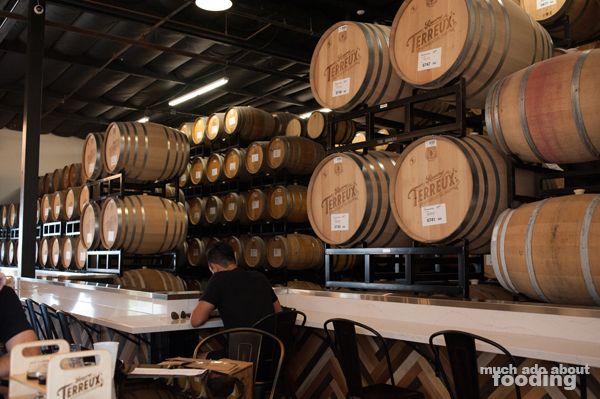 Since 2008, the barrel-aged craft beers of The Bruery have been delighting Orange County drinkers with punny names and carefully planned, tasty brews. What started off as a project by Patrick Rue who got interested in brewing and decided to forego a career in law turned into an operation that steadily grew. 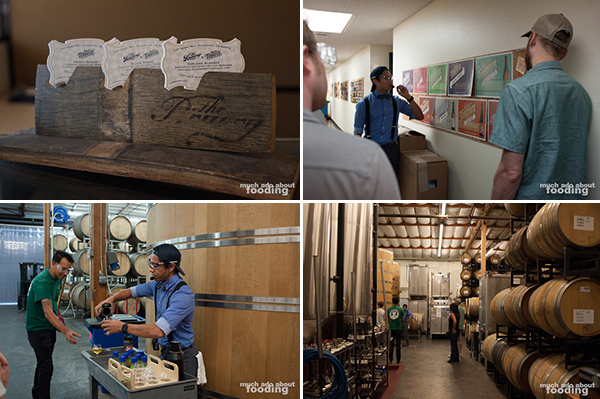 The original stomping grounds were just about twice the size of a modest administrative office and tucked away in a parking lot in Placentia but as the consumer base expanded, so did The Bruery which is now considered the biggest barrel aging and biggest barrel conditioning brewery in the nation with six warehouses to boast about. 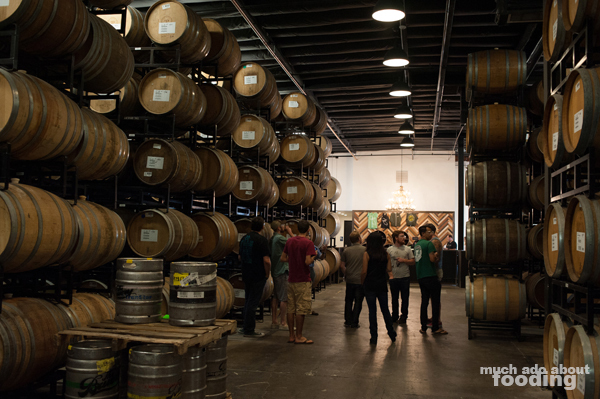 At any point in time, they house at least four thousands oak barrels! So where does Bruery Terreux fit in? 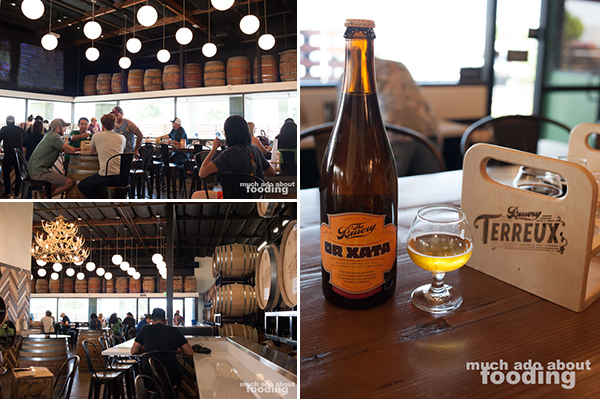 This space with a large tasting room is dedicated to producing farmhouse-style wild ales and sours. 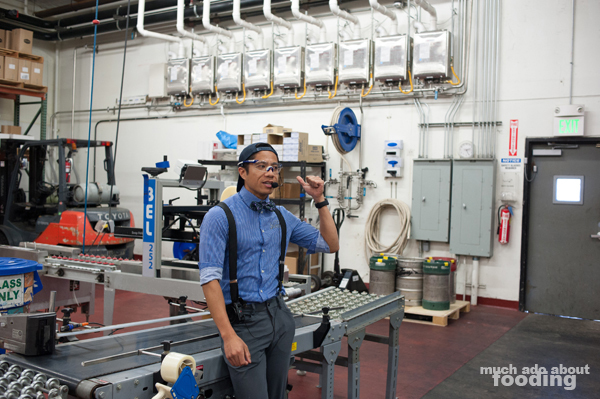 We hopped onto the opportunity to take a free tour of the establishment that opened July 8th and after Josh, our #bowtietourguide, went over the safety issues and distributed certified safety goggles, we and a few others were on our way. Because Bruery Terreux (named for its French translation as "Earth") focuses on wild and sour ales, it had to be a separate production house from the original Bruery spaces; cross-contamination is tricky when you deal with sours and can often ruin beers not intended to become sours. We learned a bit about how the common beer styles (stouts, lagers, etc) are relatively young in the grand scheme of brewing history, sitting at just a few hundred years old, while Belgian styles and others that depend on wild yeast like at Bruery Terreux have been around the longest. What propelled The Bruery to this fashion of brewing was when their Oude Tart (Flemish red ale aged 12-18 months in red wine barrels) received multiple high-level awards and recognition. Despite sours taking more time, dedication, and risk, they do have a strong fan base. 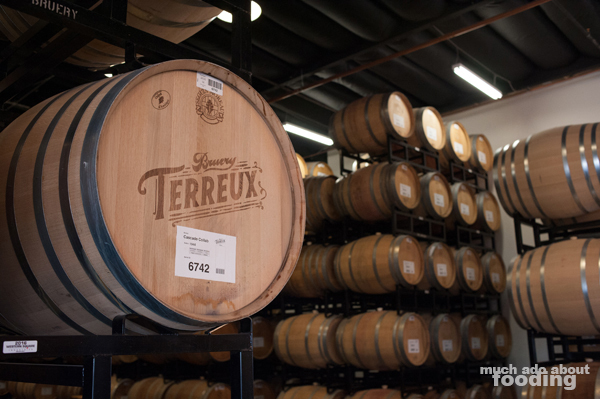 For Bruery Terreux, their ales must be aged at least 6-12 months in barrels and make use of the wild yeast brettanomyces (called Brett by brewers). 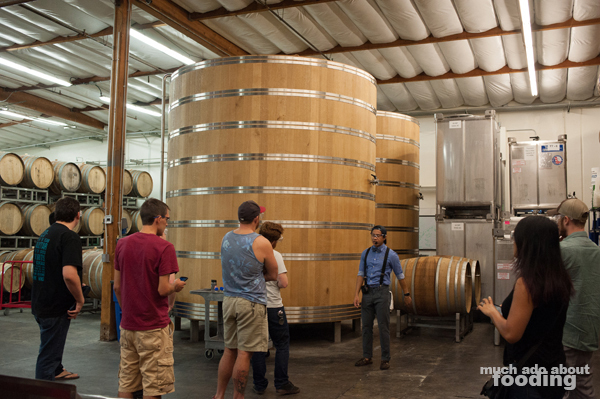 After some branding background, we gathered in their fermentation room which was filled with steel fermenters and thousands of barrels ranging from 59-gallon wine barrels to 88/120-gallon puncheons to the behemoth 7,750-gallon foeders. Not on premise? A mash tun and kettle which means that Bruery Terreux is not technicallya brewery; rather, it's a fermentation space that gets wort from the other warehouses and brings those to their tasty, beer-y forms in a few weeks' to months' time before the long aging, fermenting process. Josh pointed out that beers in the Bruery Terreux brand are, at minimum, a year old. 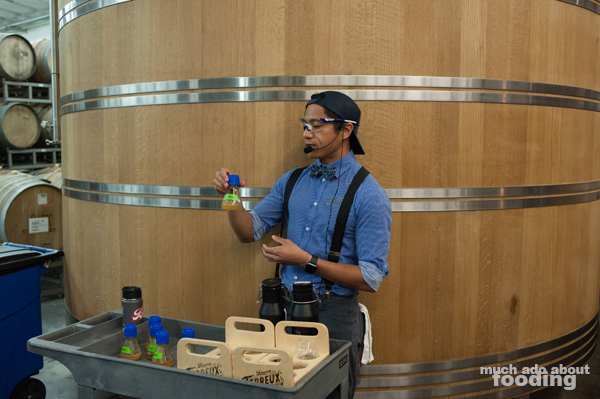 Part of the tour did have interactive components as we tasted two types of beers made at Bruery Terreux and sniffed our way around various covered flasks of bacteria. The strains of brettanomyces (lambicus and claussenii) got their rounds through the crowd of us as did lactobacillus and the overall blend of each type (smelled like cherry pie!). 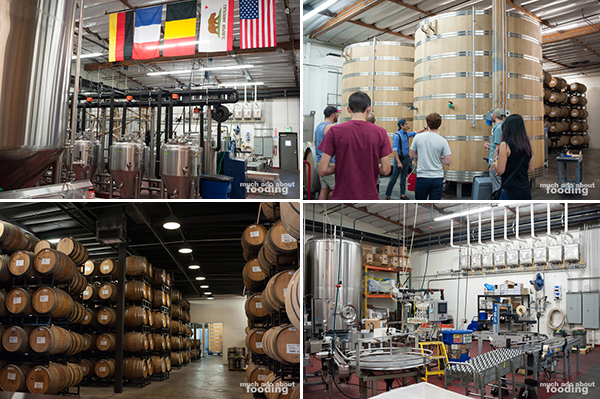 We also explored the differences between wooden fermenters (the foeders at Bruery Terreux) and steel fermenters, learned the various hoop names for barrels and the risks for pressure building up, and examined the bottling machines that get together the delicious brews everyone loves. I'd love to share more but where's the fun in that? You'll have to take 30 minutes out of one of your days soon to join the charismatic and informative Josh on a free tour of the place, and ask all the questions you want answered. All the talk of beer had us hankering for our own libations. 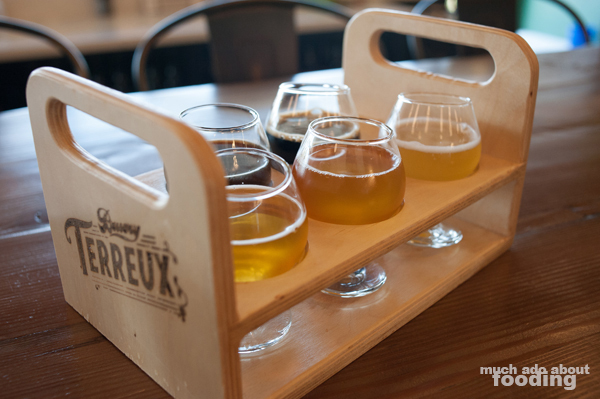 The extensive tap list in the tasting room section of Bruery Terreux featured brews from both brand lines and very reasonable prices per taster in a flight. We decided to focus mostly on the sours available but couldn't resist a few stouts in the way. Expect $1-$2 per taster which is plenty if you're doing a full five-rack as we did. The wide seating area inside opened up to an even bigger patio with access to the rotating food truck parked outside, a smart move for anyone wanting to stay a while and try several varieties. We ended up leaving with hefty bottles of their Share This: Coffee and Or Xata alongside the newfound knowledge about the new space. Find Bruery Terreux at 1174 N. Grove St., Anaheim, CA and make sure you get your free sneak peek into how they do things there.